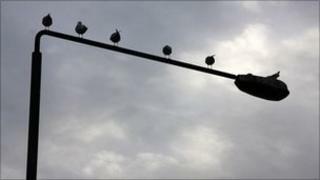 Worcestershire County Council is reviewing library services and may turn off some street lights to save money. The council said it needed to make £20m savings next year, rather than £13m it had expected to make as a result of the Spending Review. Council leader Adrian Hardman said it aimed to protect elderly care and its Safeguarding Children service. Meanwhile, Herefordshire Council, which had next year's budget cut by £10m, will be making more than 200 job cuts. Councils were told details of their financial settlements from the government on Monday. Mr Hardman said: "It's at the heavier end of our estimates, that's absolutely true. "But we now know what direction we are going to head in - but it will have an effect on services." He said the council had already found £30m of savings, including through job cuts. He said residents told the council via surveys that the services they most wanted protected were elderly care, Safeguarding Children and highways. "What they [residents] say are the lowest priorities are libraries, culture, home to school transport and street lighting," Mr Hardman said. He said the council was reviewing its library service which could lead to premises being run by communities or to closures. It is also looking at making savings through street lighting. Meanwhile, Herefordshire Council, which had next year's budget cut by 13.3%, said it was also making job cuts and looking at making efficiencies within services. Council leader Roger Philips said: "Our policy is to go very much after how we administer the services rather than the services in the first instance. "And so we are currently in the middle of our first phase of redundancies but it will be of course the biggest level of redundancies in the council's history." The council said it was trying to make sure services for vulnerable people were not compromised, but added budget pressures were expected to become tougher.